I have to thank you for the creation of another excellent addition. 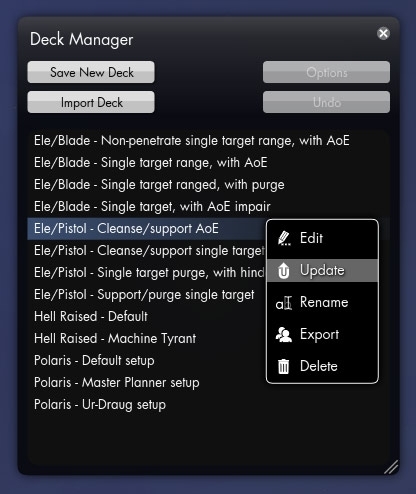 Your Deck Manager is very easy to use and allows for very descriptive naming. I look forward to changes. how exactly do you bring up the save/load window? Very neat. I'm wondering if you could do a similiar addon for talismans and weapons? I did get a weird bug. I had saved several builds during a play session. Had a video driver crash (SLI Beta drivers). When I came back in game, some of the builds were gone. Does the plugin need a successful exit to save porperly? Also can there be an option to order them alphabetically? Last edited by Tikigod : 07-15-2012 at 09:03 PM. Make sure you have restarted the client when installing this add-on, otherwise it won't start as the game hasn't read the changes to the .xml files yet. Then click the icon to the left of the compass to open it up. I could, sure, but it's not in the imidiate future as I see it now, sorry. You can force a save by reloading the UI (/reloadui or Ctrl + Shift + F1) otherwise it only happens when exiting the client properly, yes. Sorting is coming. 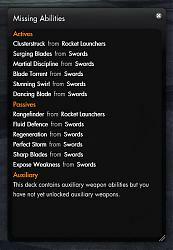 I basically want to do categories (user created), colours (user chosen) and icons for the decks to help sort them and give a better overview. No ETA though. does work for deck manager. 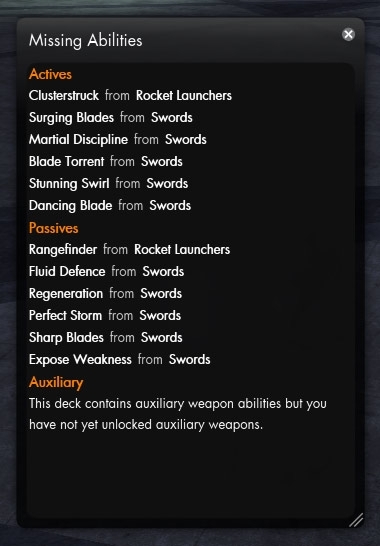 now is there a way to delete a deck? cant seem to find a button for it? thanks for this addon! love it! 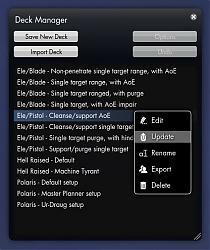 Select a saved deck and you will have a delete button. any slash commands for this module? With the workaround Im able to access the gearmanagerwindow. I can even save new decks. But when I try to select one of the decks, the pointer just clicks right through the lines. Leftclick/Rightclick, nothing works. Hmm, 1.02 hit and I no longer have the little deckmanager select icon on my topbar. I thought Funcom had an open policy on mods, hopefully that's still true and this wasn't an attempt to disable them. Re: Addons disabled in 1.02? They do and they know that 1.0.2 broke the addons.